The day after the attack on Pearl Harbor, the United States declared war on Japan. The the night before FDR spent hours working on his speech that he would give before Congress in hopes that the American people would rally behind him. Even with the objections of his cabinet, he kept it short to drive the point home. It would become not only a defining moment in his career but in the lives of all Americans. Having not been there it is hard to imagine what it would have been like to hear such words. Today we can only study the history of these events and continue telling them so that future generations will understand the events that shaped this world. 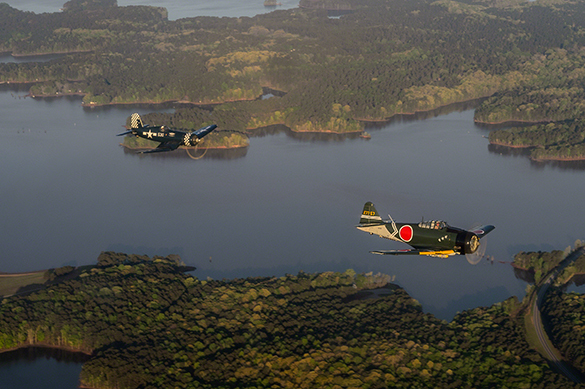 In the bowls of Aviation aerial battles two of the main characters in the Pacific Theatre, were the Corsair and Zero. While the allied nations all played a role in the Pacific many of the major naval and aerial battles consisted between the US and Japan. While the Zero played a role since the beginning of the war the Corsair wasn’t in service until 1943. The CAF Dixie Wing out Peachtree, GA has an amazing Corsair and a replica Zero which often are seen in the skies around the Eastern US. 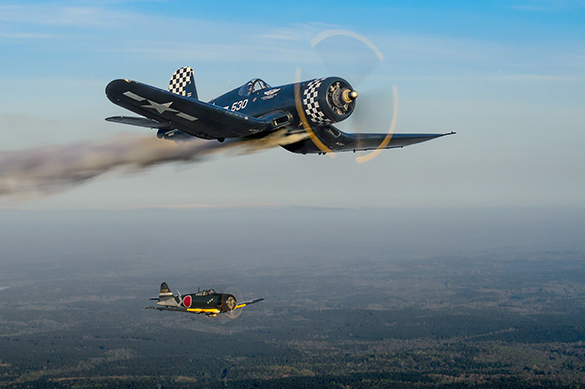 Last May Dad and I were able to reenact one of these aerial dogfights between these two adversaries.